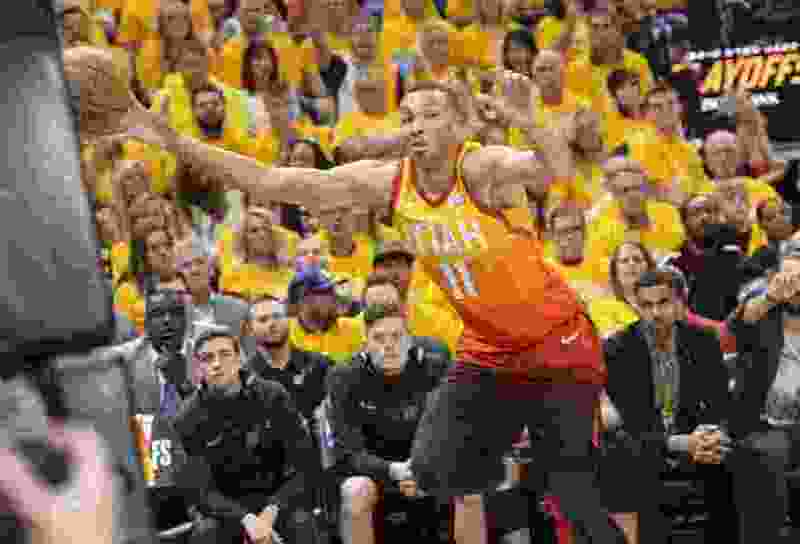 (Leah Hogsten | The Salt Lake Tribune) Utah Jazz guard Dante Exum (11) makes a save as the Utah Jazz take on the Houston Rockets in Game 3 of an NBA basketball second-round playoff series Friday, May 4, 2018 in Salt Lake City. And now, Dante Exum is back. Exum does have to stay healthy, however to realize all of his potential. After a rookie campaign in which he showed great promise defensively, he missed the following season with a torn ACL sustained during the summer. Exum looked hugely impressive during summer league last year, then missed over 70 games with a separated shoulder sustained during preseason. But when he did return, he played well — especially against the Houston Rockets in the Western Conference semifinals. The Jazz have limited money to use in free agency after re-signing Exum and Raul Neto earlier on Tuesday. They will have to decide on whether they guarantee the contracts of Ekpe Udoh and Jonas Jerebko. Beyond that, they appear to be almost finished, unless they decide against bringing Jerebko or Udoh back and dip into the free-agent market.